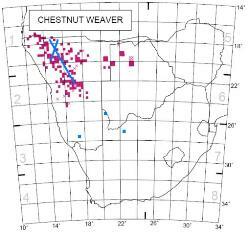 Two papers on Chestnut Weavers have been published. The first paper describes the first record of the species in South Africa, as reported in January 2011 - see here. The second paper describes long distance movements in the species, based on ringing records and out-of-range sightings. The longest distance recorded anywhere in Africa is at least 580 km, for a bird ringed at Okapuka, Namibia, by Dirk Heinrich and recovered in northern Namibia. Click on the above links to read the full papers.